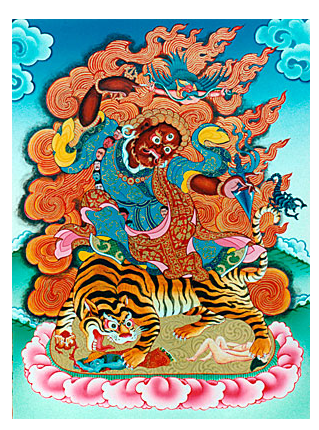 Düddul Wangdrak Dorje Drolö (Wyl.bdud 'dul dbang drag rdo rje gro lod kyi las byang / dngos drub 'dod 'jo zhes bya ba bzhugs so) ‘The Wish-Fulfilling Siddhis, A Sadhana Practice of Dorje Drolö Who Subdues Maras Through Powerful Wrath’, is a Dorje Drolö sadhana revealed by Dudjom Rinpoche. The wrathful practice of Dorje Drolö is critically important in pacifying all the negative circumstances that we face in today's world. Since the whole spectrum of Buddhadharma teachings and its essence is love, compassion, and wisdom, this wrathful practice is not just the expression of some sort of ordinary rage; rather, it is the pinnacle practice of compassion and wisdom underlying the practice of Buddhadharma at its most profound level. The very short (daily) Gyünkhyer Chok Deb Nangsé Létsen Dön Nyi  (Wyl. rgyun khyer phyogs bsdebs nang gses le tshan don gnyis). This sadhana practice of Dorje Drolö who subdues maras through powerful wrath is called “The Wish-Fulfilling Siddhi”. It came about to fulfil the wishes of Tsewang Rigzin Nampar Gyalwa Dey, the main lineage holder of this teaching, an accomplished and glorious noble one. Replete with all supplementary components for other similar practices, it is also a daily practice in terms of its easy application. I, Jigdral Yeshe Dorje, a practitioner of knowledge mantras of this supreme deity, compiled this in the ninth month of the wood monkey year during the excellent time of the waxing phase of the moon while staying with an aristocratic family in Samdrup Palace in their highest room called “The Immeasurably Pure Mansion of Swirling Lotuses" (Padma Khyil-wai Zhal-med Khang). Dudjom Rinpoche, Jigdral Yeshe Dorje, ‘The Wish-Fulfilling Siddhis’, translated by Lama Sonam Tsering and Paloma Lopez Landry, Vajrayana Foundation Bero Jeydren Publications, Corralitos, CA, 2010. Dudjom Rinpoche, Jigral Yeshe Dorje, ‘The Abbreviated Practice, The Combined Essence of the Extremely Secret Demon-Suppressing Dorje Drolö”, translated by the staff of Mirror of Wisdom Publications, 2007. Dudjom Rinpoche, Jigdral Yeshe Dorje, ‘The Secret Daily Practice of Dorje Drolö’, translated by Lama Dechen Wangmo and Ron Garry, Vajrayana Foundation Bero Jeydren Publications, Corralitos, CA, 1997, second edition 2002. ↑ Presentation of a Dorje Drolö drupchen to be given by Bhakha Tulku Rinpoche. ↑ It is a compilation of several short daily practices, and Dorje Drolö is the first one. ↑ Dudjom Sumbum, Vol Ba p211. ↑ Dudjom Sumbum, Vol Ba p189. ↑ Dudjom Rinpoche, Jigdral Yeshe Dorje, ‘The Wish-Fulfilling Siddhis’, translated by Lama Sonam Tsering and Paloma Lopez Landry, Vajrayana Foundation Bero Jeydren Publications, Corralitos, CA, 2010. This page was last edited on 7 July 2014, at 13:27.